Migration. Internal migration in developed countries (M.J. Greenwood). Internal migration in developing countries (R.E.B. Lucas). Economic impact of international migration and the economic performance of migrants (R.J. LaLonde, R.H. Topel). International migration and international trade (A. Razin, E. Sadka). Aging, Demographic Composition and the Economy. The economics of individual aging (M.D. Hurd). The economics of population aging (D.N. Weil). Demographic variables and income inequality (D. Lam). Aggregrate Population Change and Economic Growth. Population dynamics: Equilibrium, disequilibrium and consequences of fluctuations (R.D. Lee). Growth models with endogenous population: A general framework (M. Nerlove, L.K. Raut). Long-term consequences of population growth: Technological change, natural resources and the environment (J.A. Robinson, T.N. Srinivasan). Complete Index. The collection of chapters in the Handbook of Population and Family Economics and their organization reflect the most recent developments in economics pertaining to population issues and the family. The rationale, contents, and organization of the Handbook evolve from three premises. First, the family is the main arena in which population outcomes are forged. Second, there are important interactions and significant causal links across all demographic phenomena. Third, the study of the size, composition, and growth of a population can benefit from the application of economic methodology and tools. 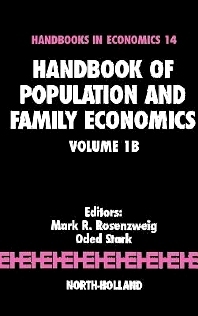 The diversity and depth of the work reviewed and presented in the Handbook conveys both the progress that has been made by economists in understanding the forces shaping population processes, including the behavior of families, and the many questions, empirical and theoretical, that still remain.